Samsung Galaxy S3 has a bigger display of 4.8 inch compared to Sony Xperia S's display which is of 4.3 inch.The Sony Xperia S's screen has slightly more sharpness than the Samsung I9300 Galaxy S3’s screen. It is 342 ppi & has display resolution of 720 x 1280 pixels. On the other side, Galaxy S3's sharpness is around 306 ppi with 720 x 1280 pixels resolution.Both the smart phones have display screen protected by the corning Gorilla glass. The Samsung Galaxy S3 is known to be 8.6 mm thick. Its Length & breadth measures to be 136.6 x 70.6mm. Dimensions of Sony Xperia S are 128x64x10.6mmThe Sony Xperia S weighs around 144 gms which is heavier than Galaxy S3 which weighs, around 133 gms. The Samsung I9300 Galaxy S3 runs on a Quad-core 1.4 GHz Cortex-A9 processor & Exynos 4212 Quad chipset. 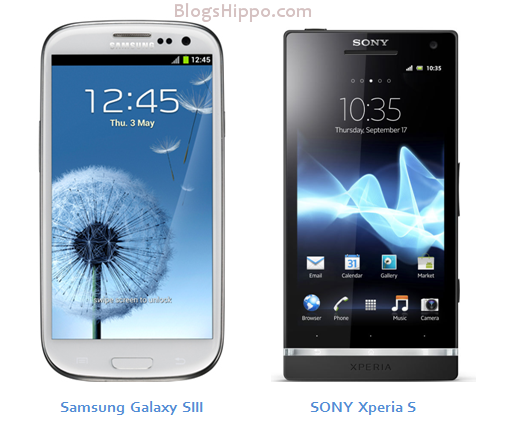 On the other hand, Xperia S is equipped with a Qualcomm MSM8260 Snapdragon chipset & Dual-core 1.5 GHz processor.Samsung Galaxy S3 has the Android OS with version v4.0.4 (Ice Cream Sandwich).Its competitor,Sony Xperia S has the Android OS with version v2.3 (Gingerbread). This Operating System is planned upgrade to v4.0. The Samsung Galaxy S3 equipped with 1 GB RAM & contains 16/32/64 GB storage.The Sony Xperia S houses 32 GB storage internal space and 1 GB RAM.Samsung Galaxy S3's memory is expandable up to 64 GB using microSD and one of the disadvantages of the Xperia S is, there is no provision to add microSD card. Xperia S's has a better primary camera compared to Galaxy S3's primary shooter.Sony Xperia S sports primary camera with 12 mega pixel & Samsung I9300 Galaxy S3 is loaded with camera of 8 mega pixels.Both the smart phones have auto focus as well as LED flash which comes handy when you need to take pictures in low light.Both the phones have secondary camera which is great advantage for tho who love to make video calls & use skype.Both the Phones are capable of shooting great videos at 1080p@30fps(frames per second) & 1080p@30fps respectively. As far as the battery life is concerned, Samsung Galaxy S3's battery life is much better than Sony Xperia S's battery life. It is preloaded with a battery of 2100 mAh standard capacity on the other hand, Xperia S is eqipped with standard battery of 1750 mAh capacity.Samsung Galaxy S3 lasts for maximum of 450 hours when 2G is accessed & lasts for 420 hours when 3G Internet accessed.